Draft: 2013, Atlanta Braves, 2nd rd. Victor has played in parts of the last two seasons with the Cubs, batting a combined .238 (57-for-240) with 10 doubles, three homers and 23 RBI ... made his major league debut in 2017 ... Ranked as the fourth-best prospect in the Cubs organization entering 2018 by Baseball America ... Named the Cubs Minor League Player of the Year in 2017 with Triple-A Iowa ... named a 2017 Pacific Coast League All-Star and was named to the U.S. Team of the All-Star Futures Game ... Owns a .290 average (519-for-1,788) with 135 doubles, 12 triples, 30 homers and 263 RBI in 501 minor league games ... owns a .372 career on-base percentage ... Was a 2016 Southern League mid-season and post-season All-Star with Double-A Tennessee ... was added to the Cubs 40-man roster, November 18, 2016 ... Named the 2015 Mills Cup Championship Series MVP, hitting .474 in the series to help Myrtle Beach to the title ... Was acquired from Atlanta, July 31, 2014, for infielder Emilio Bonifacio and lefty James Russell ... Originally selected by the Braves in the second round of the 2013 Draft ... Attended Miami Dade Junior College. Victor made his first Opening Day roster and appeared in 76 games with the Cubs, batting .232 (42-for-181) with seven doubles, two homers and 21 RBI ... recorded a 3.56 catcher's ERA (115 ER/290.2 IP) in 37 games behind the plate ... The team went 6-0 with two shutouts and a complete game in his six starts behind the dish from August 3-September 1 ... pitchers logged a 0.96 ERA (6 ER/56.0 IP) in those six contests ... Threw out 6-of-32 baserunners looking to steal ... Made 40 starts, with the Cubs going 24-16 in those games ... made 31 starts at catcher and nine starts at first base ... Batted .263 (36-for-137) with five doubles and two homers against right-handed pitching ... hit .136 (6-for-44) with two doubles against lefties ... Hit safely in five-straight games, April 6-12, going 7-for-20 with three doubles and three runs scored ... went 2-for-4 with two doubles, two runs scored and a hit-by-pitch, April 11 vs. Pittsburgh ... Went 3-for-3 with a walk, RBI and a career-high three runs scored, July 19 vs. St. Louis ... Made his first two appearances as a pitcher, July 20 vs. St. Louis (1.0 IP, 2 H, 2 R) and July 23 vs. Arizona (1.0 IP, H, 0 R) ... Hit a grand slam and recorded a career-high four RBI, September 8 at Washington ... was the second game of a doubleheader after going 2-for-2 with two runs scored in the first game ... Appeared in 32 games with Triple-A Iowa from May 28-July 2 ... batted .313 (36-for-115) with seven doubles and four homers in 32 games. Victor, named the Cubs Minor League Player of the Year, made his major league debut with the Cubs after he was recalled from Triple-A Iowa in late June ... hit .254 (15-for-59) in 31 games while making seven starts behind the plate ... named to the U.S. Team for the All-Star Futures Game, but did not participate due to his call-up to the Cubs... All told, amassed a 2.38 catcher's ERA in 75.2 innings behind the dish ... threw out two of eight baserunners attempting to steal... Also saw time at first base (eight games, three starts), right field (one game) and left field (one game)... Was 6-for-12 (.500) against lefties, and hit .191 (9-for-47) against righthanders... Recalled on June 28 and made his major league debut as a pinch-hitter that night at the Nationals (0-for-1)... Recorded his first big league hit, July 9 vs. Pittsburgh, when he doubled off A.J. Schugel ... finished the game 3-for-3 with two doubles and a RBI after coming off the bench in the fifth... Belted a game-winning solo homer in the seventh inning, July 30 in Milwaukee - his first career home run ... was optioned back to Iowa, August 1... Recalled again, August 11, when Willson Contreras landed on the 10-day D.L. (right hamstring strain) ... optioned back to Iowa, August 19, and returned to the big league club for good, September 1... In 69 games with Iowa prior to his first promotion, hit .341 (84-for-246) with 20 doubles, two triples, eight homers and 54 RBI ... had a .919 OPS... Named the Cubs Minor League Player of the Month for both May and June ... hit .366 (30-for-82) with 10 extra-base hits (including three homers) and 17 RBI in 24 May contests then batted .345 (30-for-87) with nine doubles, four homers, 21 RBI and a .970 OPS in 25 June games. Victor hit a career-best .291 (120-for-412) with 25 doubles, two triples, six homers and 47 RBI in 115 games for Double-A Tennessee, his first year at that level ... named a Southern League mid-season and post-season All-Star ... Split time between catcher and first base ... threw out 26 of 100 baserunners attempting to steal in 82 games behind the plate ... did not commit an error in 279 total chances at first base spanning 30 games ... Batted .342 (40-for-117) with a .426 on-base percentage against left-handed pitching ... Hit .310 or better in three months: May (.313), June (.310) and August (.311). Helped Single-A Myrtle Beach to the Mills Cup title, hitting .257 (101-for-393) with a career-high 31 doubles, one triple, four homers and 53 RBI ... named the Mills Cup Championship Series MVP after hitting .474 in the series ... played 86 games at catcher and 12 at first base ... Named Carolina League Player of the Week, August 24-30, hitting .500 (8-for-16) with three doubles, a triple and a RBI ... Batted .342 (26-for-76) with nine doubles, a homer, nine RBI and a .917 OPS in 20 games from August 8-September 6. Victor began the campaign with Single-A Rome in the Braves organization before he was acquired by the Cubs, July 31, for infielder Emilio Bonifacio and lefty James Russell ... joined Single-A Kane County and hit .264 (14-for-53) with 13 RBI in 14 games to close out the season ... Was his first season behind the plate, as he had manned third base in his first pro campaign ... Between the two teams, threw out 32 of 101 baserunners attempting to steal (31.7 percent) ... Began the season with a .279 average (90-for-323) with 18 doubles, four triples, five homers and 42 RBI in 87 games for Rome. Victor played 58 games for Rookie League Danville after he was selected by the Braves in the second round of the Draft ... hit .290 (58-for-200) with 29 runs scored, 23 doubles, one triple, one homer, 25 RBI, 39 walks and a .415 on-base percentage ... played 47 games at third base and one at shortstop. April 12, 2019 Chicago Cubs placed C Victor Caratini on the 10-day injured list. Fractured left hamate. 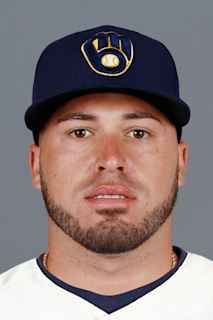 December 9, 2018 C Victor Caratini assigned to Criollos de Caguas. July 4, 2018 Chicago Cubs recalled C Victor Caratini from Iowa Cubs. May 26, 2018 Chicago Cubs optioned C Victor Caratini to Iowa Cubs. October 20, 2017 Victor Caratini roster status changed by Chicago Cubs. October 6, 2017 Chicago Cubs reassigned C Victor Caratini to the minor leagues. September 1, 2017 Chicago Cubs recalled C Victor Caratini from Iowa Cubs. August 20, 2017 Chicago Cubs optioned C Victor Caratini to Iowa Cubs. August 11, 2017 Chicago Cubs recalled Victor Caratini from Iowa Cubs. August 1, 2017 Chicago Cubs optioned C Victor Caratini to Iowa Cubs. June 28, 2017 Chicago Cubs recalled Victor Caratini from Iowa Cubs. March 17, 2017 Chicago Cubs optioned C Victor Caratini to Iowa Cubs. November 18, 2016 Chicago Cubs selected the contract of Victor Caratini from Tennessee Smokies. April 4, 2016 C Victor Caratini assigned to Tennessee Smokies from Myrtle Beach Pelicans. March 7, 2016 C Victor Caratini assigned to Chicago Cubs. April 6, 2015 C Victor Caratini assigned to Myrtle Beach Pelicans from South Bend Cubs. March 19, 2015 C Victor Caratini assigned to Chicago Cubs. October 30, 2014 C Victor Caratini assigned to Senadores de San Juan. October 30, 2014 Senadores de San Juan placed C Victor Caratini on the reserve list. September 3, 2014 Victor Caratini roster status changed by Kane County Cougars. July 31, 2014 Chicago Cubs traded 2B Emilio Bonifacio, LHP James Russell and cash to Atlanta Braves for C Victor Caratini. July 31, 2014 C Victor Caratini assigned to Kane County Cougars. March 31, 2014 C Victor Caratini assigned to Rome Braves from Danville Braves. October 30, 2013 3B Victor Caratini assigned to Leones de Ponce. October 30, 2013 Victor Caratini roster status changed by Leones de Ponce. June 17, 2013 Atlanta Braves signed Victor Caratini. June 17, 2013 3B Victor Caratini assigned to Danville Braves.